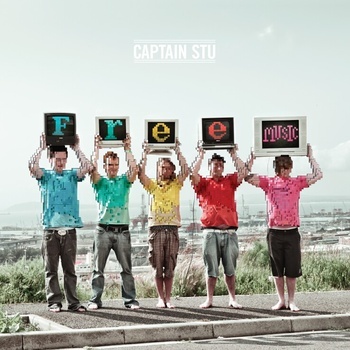 Based in Cape Town, South Africa, Captian Stu has been performing throughout the region ever since 2003. The five piece band brings us some of the most upbeat sounds I heard in a while; and with the unique and highly addicting blend of ska, funk, punk, and just a touch of fresh African flavor, their music will surely bring back all the wonderful days of summer that quickly got away. So go ahead and get yourself a little bit of sunshine infused beats of the Free Music EP. And yes, just as the title suggests it is yours to enjoy entirely free of charge. It’s hard to pin point the favorite track on the album filled top to bottom with such a unique and fun sounds. In fact all of the five songs bring miles of energy that is hard to find anywhere these days; an energy that should not be missed. It’s quirky lyrics will make you sing along all day, and it’s fun loving harmonies will make you feel like vacation is just around the corner. Are you ready to party yet? Hit play and enjoy! We have a bright and busy future ahead of us. A future teeming with big crowds, bigger music, epic tours, savage parties, sponsorships, investments, retirements and inevitably, funerals. We would love it, though, if you’d be smart enough to hop onboard with us before the inevitable end, and be a part of – or at least a witness to – the emergent Captain Stu phenomenon. We would never dream of disappointing you. Of course not. We are Captain Stu.